⋅ Academic scholarships range from $4,500-$22,000 per year. ⋅ 73% of students receive an academic scholarship. 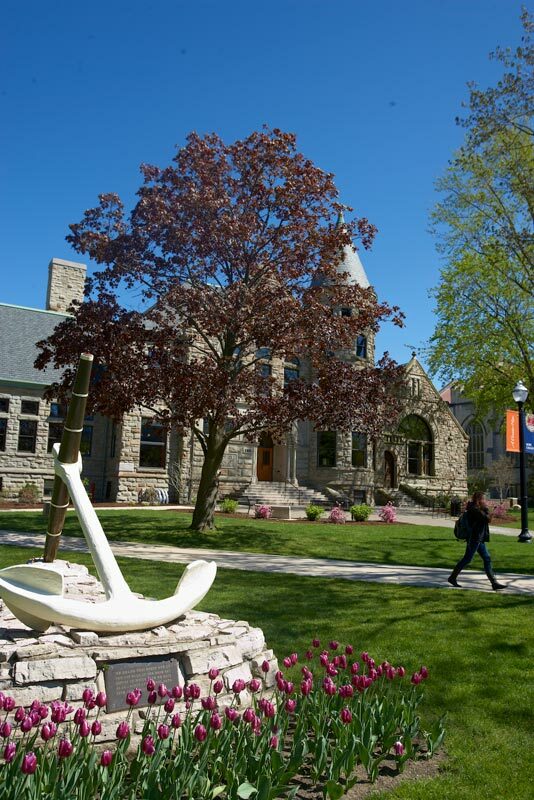 Hope College inspires students to be fully alive in mind, body and spirit through an exceptional liberal arts education and a community grounded in a vibrant Christian faith. This “big-small” college features a large variety of programs while ensuring personalized attention. Scenic location: on the eastern shore of Lake Michigan, about 30 miles from Grand Rapids, 150 miles from Chicago, 175 miles from Detroit and 225 miles from Indianapolis. As a liberal arts college offering education within the context of the historic Christian faith, Hope is a place of open inquiry, acceptance of intellectual challenge, rigorous engagement with challenging questions, and vigorous but civil discussion of different beliefs and understandings. Hope is one of the most environmentally responsible colleges in the United States and Canada, according to The Princeton Review, which selected Hope for inclusion in the third annual edition of its free downloadable book, The Princeton Review’s Guide to 322 Green Colleges: 2012 Edition. The College’s Phelps Scholars Program has been recognized by the Association of American Colleges and Universities among only 32 institutions nationwide as an exemplary diversity program in higher education. Double or triple your preparedness: Across 90-plus programs, numerous rare double majors exist, such as chemistry and dance. Personal attention: 11:1 student:faculty ratio; senior professors often teach intro classes, too. Hope obtains more funding from sources such as the National Science Foundation, National Institutes of Health, and NASA to support its undergraduate research program than any other liberal arts college in Michigan. Hope has one of the largest summer undergraduate research programs in the nation, involving approximately 180 participating students each year. Such faculty-student research partnerships have been common at Hope since the 1920s. Over 90% of Hope science majors have at least one semester or one summer of collaborative research with Hope faculty. Government and foundation grants to individuals, to departments, and to the college demonstrate the quality of the institution: outside grants to departments and faculty have totaled more than $4.6 million in the past two years. The Templeton Guide: Colleges that Encourage Character Development recognized the college’s First-Year Seminar, Campus Ministries and Senior Seminar programs for providing leadership in character development. Hope College is one of the few liberal arts colleges with accreditation in all four areas of the arts: art, dance, music and theatre. In each case, we meet or exceed national standards from the National Associations of Schools of Art and Design, Dance, Music and Theatre. Hope also has accredited programs in athletic training, biochemistry and molecular biology, chemistry, education, engineering, nursing, and social work. In the “America’s Best Colleges 2019” guide published by “U.S. News and World Report” Hope is listed in the first tier among the best liberal arts colleges in the nation (as opposed to region), placing 103 out of 233 institutions for 2019. Major-related work experience: over 300 study abroad programs in over 60 countries; thousands of internships a year available locally; recent off-campus internships at a Nashville recording studio, a California urban ministry, the Philadelphia District Attorney’s Office, and New York City’s Dateline NBC. Thousands of internships are available locally or through programs in Philadelphia, Chicago, New York, Washington, D.C, Oak Ridge (Tennessee), and El Paso (Texas). Recent internships have included the Mayor’s Office (Chicago), Late Night with Conan O’Brien (New York), the Philadelphia Eagles, and the American Bar Association (Washington, D.C.). 57% of the Class of 2017 indicated that they completed an internship during their time at Hope. Hope College’s Boerigter Center for Calling and Career supports students through their search of thousands of internship postings. The Boerigter Center for Calling and Career is a college-wide initiative that seeks to inspire students to engage in lifelong practices of career development by emphasizing discernment, preparation and pursuit. Programming for the Boerigter Center is designed to enable all Hope students, beginning in their first semester, to understand their strengths, engage in experiences that directly connect to career preparation, discern vocational and life goals, and ascertain clear next steps toward their future. Showcasing research and performance: 382 students presented 247 projects during Hope’s Celebration of Undergraduate Research and Creative Performance in 2018. The Council on Undergraduate Research awarded Hope with its 2017 campus-wide Award for Undergraduate Research Accomplishments (AURA). The award recognizes exceptional undergraduate research, scholarship, and creative activity programs. Hope is the only institution in Michigan to have earned the award. Hope ranks in the top 100 of the “Best liberal arts colleges in the United States 2018” from the Wall Street Journal/Times Higher Education US College Rankings. Hope ranks #64 in Kiplinger’s list of 100 Best Values in Liberal Arts Colleges. Hope ranks #135 among all colleges. Openly Christian and rigorously intellectual: valuing open-mindedness and respect for all opinions; historically affiliated with the Reformed Church of America; embraces religious diversity and home to the Union of Catholic Students and InterVarsity Christian Fellowship. Championship athletics: winning tradition in 20 sports, emphasizing scholar-athletes and character-building; supportive local community. Hope offers more than 80 clubs and organizations (including a number of service-oriented projects), as well as an extensive intramural program; 90% of students stay on campus during the weekends. More than careers – vocations: freshman and senior seminars focus on each student’s educational trajectory and shaping of a life plan before graduation. Hope College, like all the CTCL schools, does a phenomenal job preparing students (who are pretty talented to begin with) for graduate and professional school and for creative and industry-changing careers. A quick perusal of Hope’s similar successes and outcomes gives clear evidence to that. Approximately 94% of students are in the workforce or graduate school within six months of graduation. Over 86% of 2017 graduates were employed full time at a job related to their college major, and nearly 21% were enrolled in graduate school. In addition to an excellent foundation for career or further education, Hope students also take with them a firm grasp of their role to be servants in the communities they join after Hope. This comes from a culture of giving that permeates the Hope community — both on campus and beyond. In a typical year Hope’s 3,200 students volunteer over 100,000 hours and raise over $1 million in actual dollars and sweat equity. In 2011, Hope was among the 115 colleges and universities recognized recognized by the Carnegie Foundation for its community service and social responsibility.